Two new SILA videos from yesterday 8/1/17. A peak at the SWGE construction from Toontown. Mostly the taller structure being constructed on the southern side of the MF building. 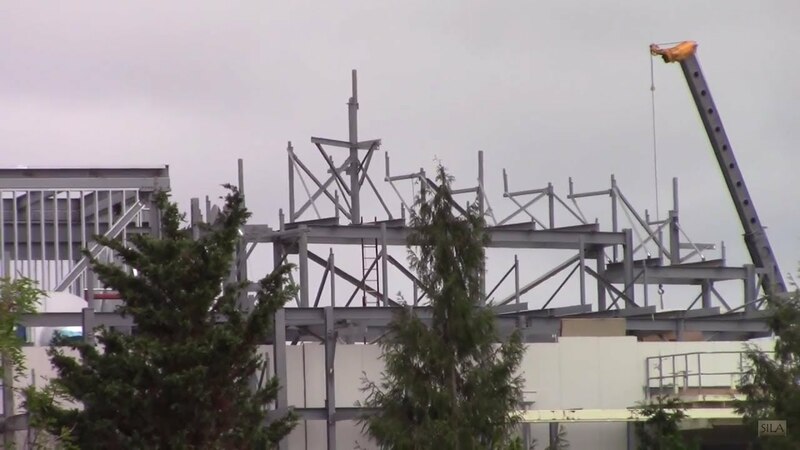 Star Wars: Galaxy's Edge construction. Not much work being done for a Tuesday, just a few workers here and there...except the guy singing while laying tile in the parking structure. At 7:00 a flashing red light reflecting off of the curved HVAC duct work from below in the circular structure. 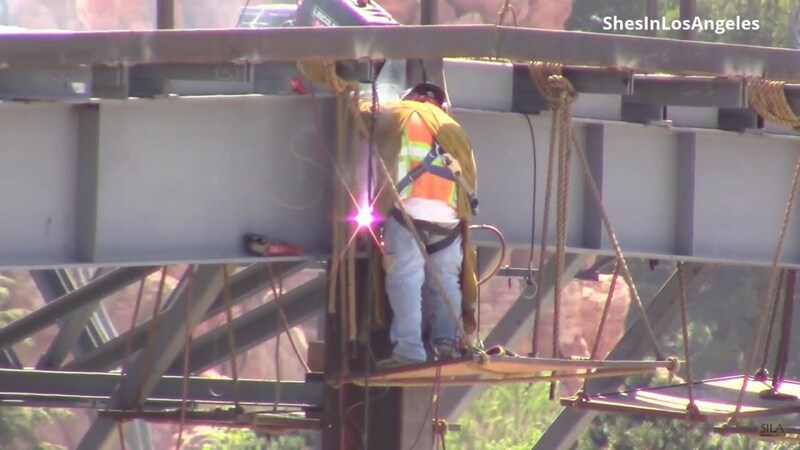 Is that just the reflection of a flashing red light on a piece of construction equipment, or might it be something else? Is OP going to edit 1st post to this thread? Much is now obsolete. 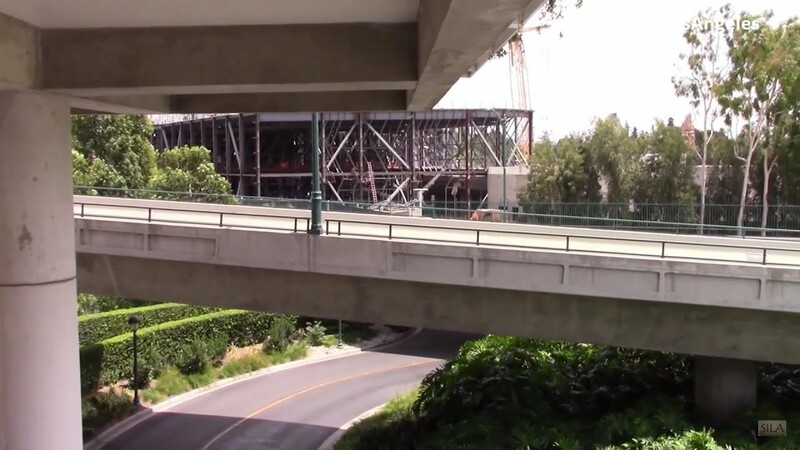 I was thinking that maybe a Project Tracker 6 should be started as a new thread, perhaps moving the Galaxy's Edge-related posts over to that one. I also think a "Joy of Fastpass 3" is coming for MaxPass, but they're going to wait until the kinks are worked out. Still, I'm fairly certain that PhotoMatt is the only Micechat moderator handling this forum, especially now that Andy Castro (Master Gracey) is starting his own blog. Much of the old guard has turned over, unfortunately. Much of the old guard has turned over, unfortunately. I'm not sure why. I don't know what happened to everyone. I do know that the Facebook page is very active, so it's possible that many people went there. I will make new threads once the forum owner decides what he wants to do with the forum. I have suggested moving to different software, but MiceChat has been run on vBulletin for 12 years so he is very hesitant. The last time we switched hosts the site was down for two weeks, so that also concerns him. I am trying to convince him that this can all be done quickly, but his previous experiences have been negative. This can all be done in a day, so I have no idea why the previous switch took two weeks. I created a VM on my laptop which has an i3 processor and it took less than an hour to make everything work. So, I am trying. That's really all I can say. I definitely miss many of them, haha. I am a fan of the forum structure for fansites. I would certainly appreciate an update and/or redesign to make everything smooth on the backend and pretty on the frontend. Thanks for all your hard work with this, too. It doesn't go unnoticed. I really hope he gives the OK! I love this forum but it definitely needs an upgrade lol. Two new SILA videos from yesterday 8/4817. 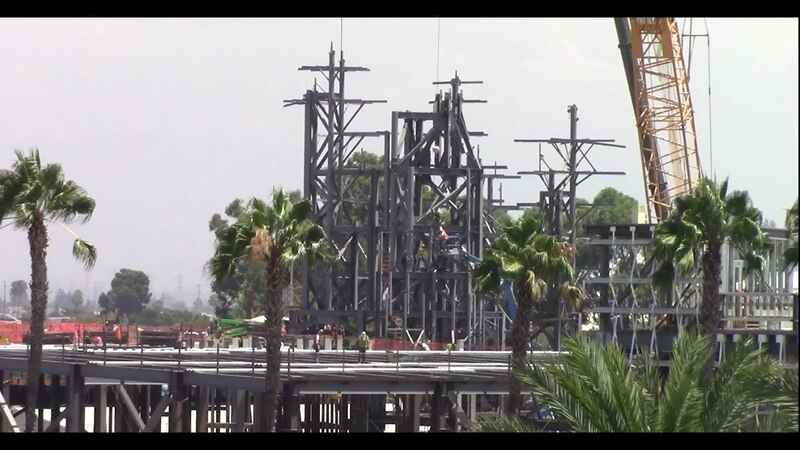 Star Wars: Galaxy's Edge construction from Toontown. 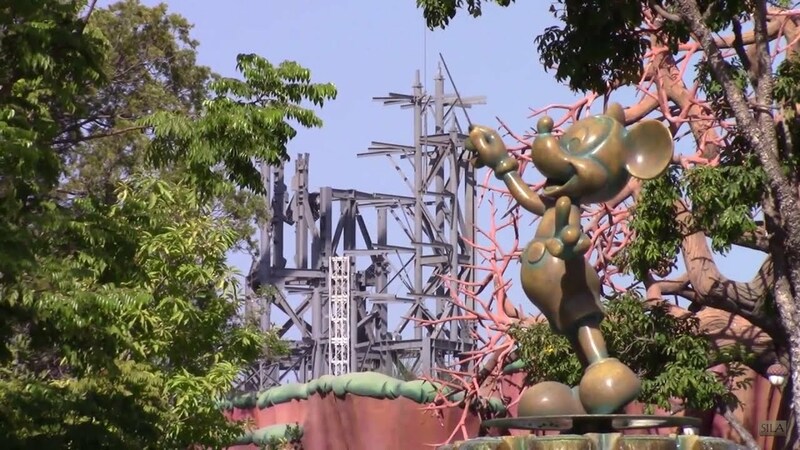 It looks like a construction elevator has been installed on the tall steel structure on the southern side of the MF building, at least that's what it looks like from Toontown. Last edited by Hammer; 08-05-2017, 05:22 AM. SWGE construction from Disneyland Dr. and the M&F parking structure. At 2:40, you can really get a good idea what the scale of the Hanger Bay is...huge. 7:00, looks like some taller steel structure is going up on the southern side of the BE building.10:50, the steel framework for the MF building has been extended much farther to the east covering the two remaining circular foundations. Watching these high rise steel workers do what they do always amazes me and makes me glad I'm not doing that kind of work. Two new SILA videos from Friday 8/11/17. A lot of work going being done on the roof of the BE building in general. 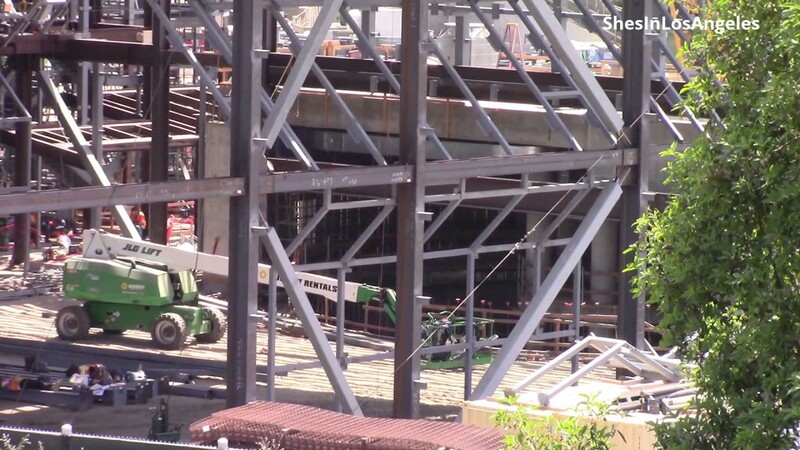 They're installing steel studs on the exterior of taller rectangular structures, you can see at least one door framed. At 3:50, pads for steel structure on top of the western concrete structure of the BE building, something much taller is going up there. 9:50, it looks like steel standoffs are being installed on the front of the BE building. 10:30, the horizontal supports for scaffolding planks are now in place for installing and finishing the rock work on the front of the MF building. I wonder how long it will be before they start bringing in the steel wire and mesh rock tiles. 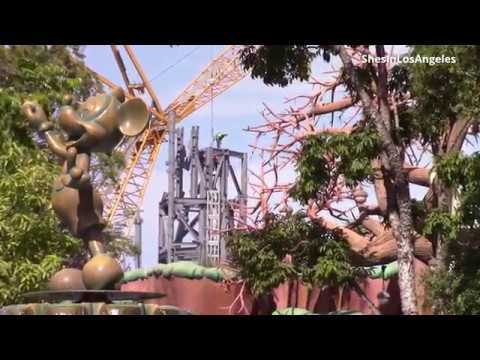 A short look at SWGE construction from Toontown. A new video from Yensid 55 was posted last night. It covers the month of July, so it has pre-attraction opening, the opening of the attractions, as well as some D23 coverage. Much of it we have seen, but I love the extra detail, perspective, and knowledge they bring to the construction. The real treat is at the end when they show a view through the crack of the Fantasyland entrance tunnel wall. We can see a view of the BE show building that we (or at least I) haven't seen before. They even dissolve it to the model at D23. Pretty awesome stuff. I always enjoy Yensid 55 videos! Mark and his daughter Megan always do a great job of documenting the construction and exposing interesting details. Two new SILA videos from yesterday 8/15/17. SWGE construction from the Mark Twain Riverboat. 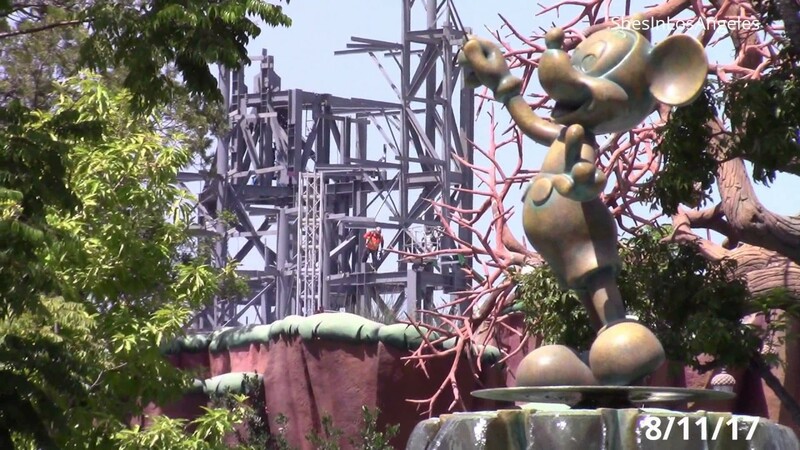 Unless the trees grow considerably, and they probably will over time, quite a bit of the BE and MF attraction will be visible from the Rivers of America. At 1:20 some steel structure for rock work is going up on the eastern and southern side of the BE building. We can also see the exterior finish material the has been installed on the eastern wall of the BE building as well...it will be very interesting to see how this progresses. Last edited by Hammer; 08-16-2017, 05:58 AM. SWGE construction update from the M&F parking structure. At 6:00 insulation is being installed on the northern exterior wall of the BE building. 11:10 some HVAC equipment has been placed on top of the concrete annex on the western side of the BE building. The trees will definitely grow in over time. Also gotta consider that everything after about the 2:00 mark she is a lot further south along the river (probably the halfway point just before the boat turns east again) and zoomed in significantly, so with the naked eye it won't be as noticeable. Either way, when all is said and done we will see mountains behind the trees and hopefully it will look somewhat natural. Not only that, but there's something to be said for the fact that she was looking 'back' to where the boat had already been. Lots of rides expose things you shouldn't see when you look behind you. Now, of course, the riverboat is more of a 360 degree experience, but more people will be looking forward to what's next than back at where they've been. I looked at Mint Crocodile's pictures of D23 and it looks like the Battle Escape ride vehicles will hold 8 passengers and have a droid in front of the car. Yep. That's a classic R5 unit (ala R5-D4, the droid with the bad motivator). That pic, along with the rest of the info from D23 information, has circulated around MC, ever since it became available at D23. Instagram user FSX404 took another overhead pic of SW:GE a couple days ago. Looks like they are getting close to completing the frame work over the western MF circles and the roof over the BE hanger room is now completely covered. There also seems to be little things going on in other areas and some preliminary foundation work where the shops will be.